Kathy Cater and Geoffrey Agrons live on the 18th floor with a view of Philadelphia's Art Museum. Inside the apartment they house their own collection of arts and crafts furnishings and photography, including a prized photo of a California eucalyptus grove shrouded in fog. 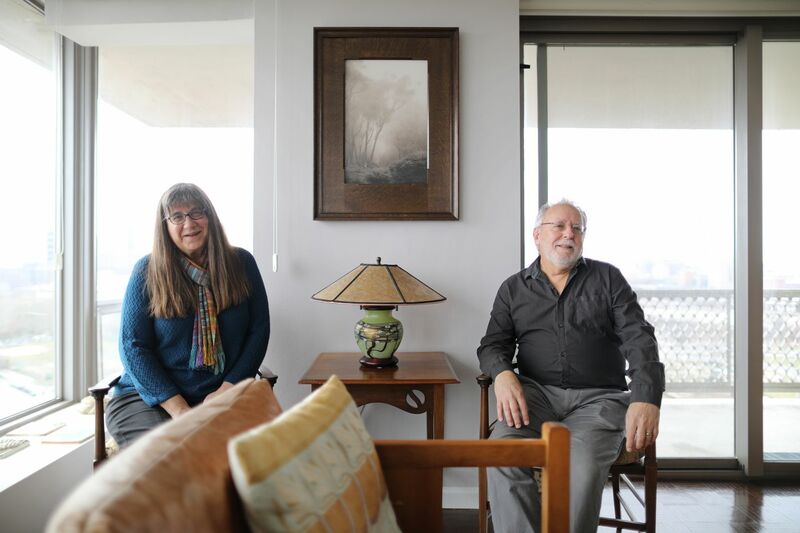 After 34 years of marriage, 15 homes, and three cities, packing and unpacking their ever-growing collection of arts and crafts and mid-century modern furniture and objects, Kathy Cater and Geoffrey Agrons may finally have come to rest. “I’ve been searching for something called home since I lived with my parents,” said Agrons, sitting in his living/dining room at the Philadelphian and taking in the 18th-floor views of Philadelphia’s Art Museum area. “It feels like it now, maybe because we’re beginning to age,” he said. Agrons, a retired radiologist-turned-freelance-photographer, and Cater, a retired law librarian, are in their mid-60s. Natives of South Jersey, they spent much of their early married years in Philadelphia but moved to the San Francisco Bay area in 2011. They returned to Philadelphia in 2015 to an apartment on Washington Square and then to a historic house they bought on Spruce Street. Geoffrey Agrons and Kathy Cater's collection showcases arts and crafts furnishings, including an L. & J.G. Stickley bookcase in the dining room. For their next and perhaps final move, space and light were key issues. “We have, over the years, done a bit of furniture collecting and object collecting,” Cater said, in a bit of an understatement. The Philadelphian turned out to be one of the few places where they could rent enough space. The three-bedroom, 2½-bath apartment has about 2,000 square feet. And light floods the living/dining room, home to many of their collectibles. The Art Museum itself is visible from the patio. Cater and Agrons moved in last fall, renting from a couple who had bought the apartment as an investment property. Eventually, they might be interested in buying it, Agrons said. The couple started collecting turn-of-the-century arts-and-crafts pieces — both originals and reproductions — in the mid-1980s. One of their prize pieces is a small but intricate pewter-and-enamel clock by Archibald Knox for Liberty & Co. of London. It sits atop an original L. & J.G. Stickley bookcase, circa 1910. One of the prize pieces is a pewter-and-enamel clock by Archibald Knox for Liberty & Co. of London. Near a doorway is a circa-1900 plant stand of cast copper and oak by the sculptor William Reynolds-Stephens. Across the room is a reproduction ebonized ash table designed by Charles Rennie Mackintosh. They also have a carbonized ash table from the Frank Lloyd Wright period. And in the hall is a rare 1910 clock by L. & J.G. Stickley cabinet makers. There are numerous finely wrought Knox pewter objects, including a tea set and — in a quick bow to the contemporary — glazed ceramics by the famed mid-century studio potters Gertrude and Otto Natzler. “You see a lot of stylized plant forms,” Agrons said, a characteristic of the arts-and-crafts movement. Light floods the three-bedroom, 2½-bath apartment, which has about 2,000 square feet. It's perfect for collectibles. In addition to the collectibles, stylized plants are reflected in one of Agrons’ prized photographs, a eucalyptus grove in Berkeley, Calif., shrouded in dense fog. Other photos line the hallway to the bedrooms. Despite the extensive collection, the apartment doesn’t feel cluttered. It’s a smooth matching of space and content that may explain the couple’s feelings of permanence. “We’ve owned too many condos to count,” Cater said. The rare clock in the foyer was made in 1910 by L. & J.G. Stickley cabinet makers.